The doctrine of eternal security or “once saved, always saved” is a widely believed teaching. Although no such terms exist anywhere in the Bible, what the preacher says about the belief may on first glance sound plausible, but is he right? Doing His commandments — obeying His laws — is what makes us worthy for eternal life, symbolized by the tree of life. The implied opposite, then, means that if we don’t do His commandments we will not have this special right to everlasting life. A Scriptural truth that is not understood by many is that Yahweh does not save us in our sins, He saves us from our sins — from the death penalty that we because of our sins deserve. We cannot continue in sin and still expect Him to redeem us for His Kingdom. In fact, He makes it clear that He will not do so. “The wages of sin is death,” Paul wrote in Romans 6:23. Sins must be repented of and no longer indulged in. If we are in unrepented sin we will not be granted everlasting life. Yahweh does not reward sin. Notice: “Know you not that the unrighteous [lawbreakers] shall not inherit the Kingdom of Elohim? Be not deceived: neither fornicators, nor idolaters, nor adulterers, nor effeminate, nor abusers of themselves with mankind, nor thieves, nor covetous, nor drunkards, nor revilers, nor extortioners, shall inherit the Kingdom,” 1Corinthians 6:9-10. By definition, sin is the breaking of any of Yahweh’s laws, 1John 3:4. Clearly, it does matter if a person remains true to Yahweh and it matters very much whether he or she indulges in the sin of this world. Paul tells us, “Be not deceived; Elohim is not mocked: for whatsoever a man sows, that shall he also reap. For he that sows to his flesh shall of the flesh reap corruption; but he that sows to the Spirit shall of the Spirit reap life everlasting,” Galatians 6:7-8. Surely a man like the Apostle Paul, who wrote the majority of the New Testament and had direct revelatory teaching from Yahshua (Gal. 1:11-12 ), would know whether he himself had salvation assured. If the eternal security doctrine is true, then Paul of all people believed it and taught it. Right? On the contrary. “All I want is to know [Messiah Yahshua] and the power of His resurrection…That is the way I can hope to take my place in the resurrection of the dead. Not that I have become perfect yet: I have not yet won, but I am still running, trying to capture the prize for which [Messiah Yahshua] captured me. I can assure you my brothers, I am far from thinking that I have already won,”Philippians 3:10-13, Jerusalem Bible. “Examine yourselves, whether you be in the faith; prove your own selves…” 2Corinthians 13:5. “For we are made partakers of Messiah, if we hold the beginning of our confidence stedfast unto the end,” Hebrews 3:14. Knowing exactly when the saints are saved will reveal the error of both the once saved, always saved doctrine and the popular understanding about being “born again” at conversion. Neither teaching is scriptural, based on what the Bible says about how and when salvation occurs. What few today grasp is that saving is a process, which starts with being begotten of the Holy Spirit at baptism and ends with being born again at the resurrection. An analogy about being saved is helpful here. Yahshua said that men would hate the truth, “but he that endures to the end shall be saved,” Matthew 10:22. 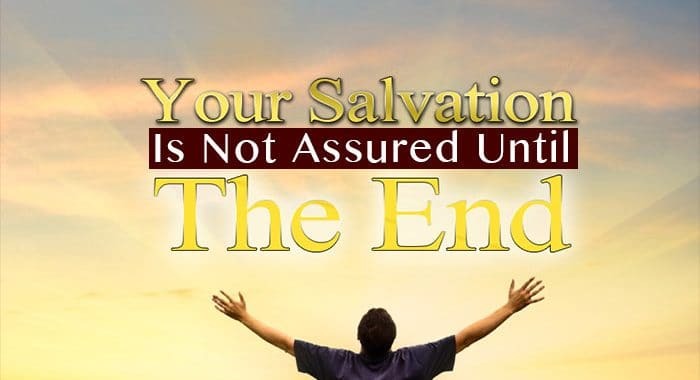 We may have hope of salvation, but it isn’t assured until the “end”— either the end of our lives or the end of this age when Yahshua comes to gather His elect. Why? Because at any point we could become apostate. We could fall from grace by slipping back into the world through its many sins and temptations. If that happens to us we are in jeopardy, because Yahweh does not save sinners. Rather, he saves those who have repented of sin and turned to walk in His ways. Yahweh said through the prophet, “But if the wicked will turn from all his sins that he has committed, and keep all My statutes, and do that which is lawful and right, he shall surely live, he shall not die,”Ezekiel 18:21. We learn from 1Corinthians 3:16 that Yahweh will destroy those who once knew the truth but become defiled. “Know you not that you are the temple of Elohim, and that the Spirit of Elohim dwells in you? If any man defile the temple of Elohim, him shall Elohim destroy; for the temple of Elohim is holy, which temple you are. Let no man deceive himself.” Even though the last verse of this passage, 23, says that we are Messiah’s, Paul shows that the possibility still exists that we could fall. Those that do fall through disobedience will be cut off. “Be not highminded, but fear: For if Elohim spared not the natural branches, take heed lest he also spare not you. Behold therefore the goodness and severity of Elohim: on them which fell, severity; but toward you, goodness, if you continue in his goodness: otherwise you also shall be cut off,” Romans 11:21-22. “Goodness” means moral excellence. To fall from moral excellence is to disobey, as verse 30 reveals (“have not believed” means to disobey, see ASV and Rotherham). Most who hold to the eternal security teaching dread what they call “works salvation.” They believe that Yahweh requires nothing of His people but faith alone. Any hint of the necessity of obedience sends them into paroxysms of distress and incredulity. Certainly we are not saved by our works. The Scriptures are clear on that. We are not justified by keeping the law, Romans 3:20, but by His grace, v. 24. Justification means “just as if” we had not sinned. Nothing we can do will “earn” us righteous standing in His sight because we have all sinned and are nothing but filthy rags, Romans 3:23. Once we are justified by His grace, however, then we are set apart for a holy purpose, which is called sanctification. Through sanctification Yahweh expects His people to live pure and righteous lives. “Having therefore these promises, dearly beloved, let us cleanse ourselves from all filthiness of the flesh and spirit, perfecting holiness in the fear of Elohim,” 2Corinthians 7:1. Notice the verse does not say, “Let Yahweh cleanse us,” but rather, “let us cleanse ourselves.” Live purely. Overcome the pulls of sin. In the same vein we are commanded to “work out your own salvation with fear and trembling,” Philippians 2:12. If one is already saved, no fear and trembling would be necessary! Neither would there be a need to work out any salvation. A sanctified individual not only lives a life apart from sin, but also is obedient to what Yahweh tells Him to do. “For this is the love of Elohim, that we keep his commandments: and his commandments are not grievous,” 1John 5:3. He has commanded His people to keep His laws, including His Feasts and Sabbaths. They do so not because they are earning their salvation, but because they now live for Him and are in the process of taking on His very nature. We reflect His nature when we do what He would do and follow His direction. He is the Father and we His children. We obey Him just as we obey our earthly parents. We don’t obey our parents for a reward, but because they are our parents and they demand obedience. Our love for them makes us want to obey them. The prophet Ezekiel warns, “But when the righteous turns away from his righteousness, and commits iniquity, and does according to all the abominations that the wicked man does, shall he live? All his righteousness that he has done shall not be mentioned: in his trespass that he has trespassed, and in his sin that he has sinned, in them shall he die,” 18:24. Does this passage just apply to ancient Israel? 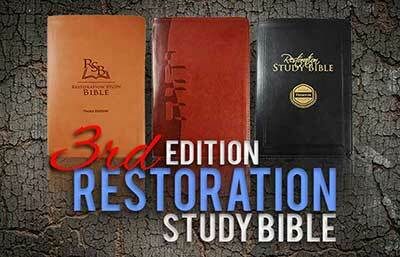 Ezekiel and other prophets prophesied not only for their day but also for our day and beyond. Yahweh does not change, Malachi 3:6. What was true of His people anciently is true of His people today. He has but one standard. Paul said that all that happened in the Old Testament was for our example, 1Corinthians 10:11. 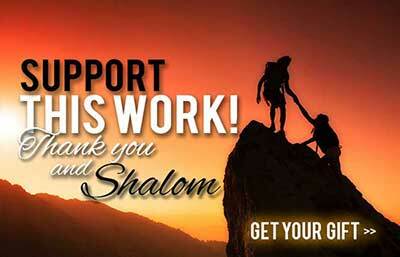 The Bible is filled with assurances that Yahweh will reward His chosen according to their deeds. Both an obedient life and a sinful life will be rewarded accordingly, Romans 2:6-9.The final book of the Bible shows that the saints are those who keep the commandments of Yahweh and have the faith of Yahshua, Revelation 14:12. Faith and obedience go hand in hand Clearly, it is the obedient — who are faithful until the end — who are saved, Hebrews 5:9, and not those who flout His commands and live the life they choose still expecting a Kingdom reward. Posted in Baptism and Salvation, Booklets. Thank you so much for this. I’ve wrestled with this for many years. And had seversal discussions with pastors. But none of them have ever been able to satisfy me with scripture based proof to support the once saved, always saved teaching. What about prodigals that return back to The Lord after repenting and not knowing about what you just wrote on not saved until the end. The key to what you stated is that they repented. That’s the point. It is those that do not repent that run the risk of losing their salvation.